I was pleased to have a poster accepted at the EDEN (European Distance and E-Learning Network) conference in Porto, Portugal this year. I have written a blog post about the content of the poster which you can find here. Being in Education Technology I did feel the need to add a bit extra to the poster! So, alongside a QR code that links to the blog post I also used layar, an augmented reality app. On the poster there was a screenshot from a youtube video of my colleague and co-author Evelyn Reisinger speaking about setting up the course on Moodle (seen at the bottom left of the above image). To view it you needed the layar app on an apple or android device. My colleague Farzana Latif has been doing some work with augmented reality and set this up for me, so thanks Farzana! By scanning the screenshot using the layar app the video of Evelyn started to play. It went down very well at the conference so I would recommend it. It’s great to be able to make a one dimensional poster more interactive. We have a poster presentation at the EDEN conference in Porto, Portugal next week. The conference theme is ‘Closing the gap from Generation Y to the mature lifelong learner’. 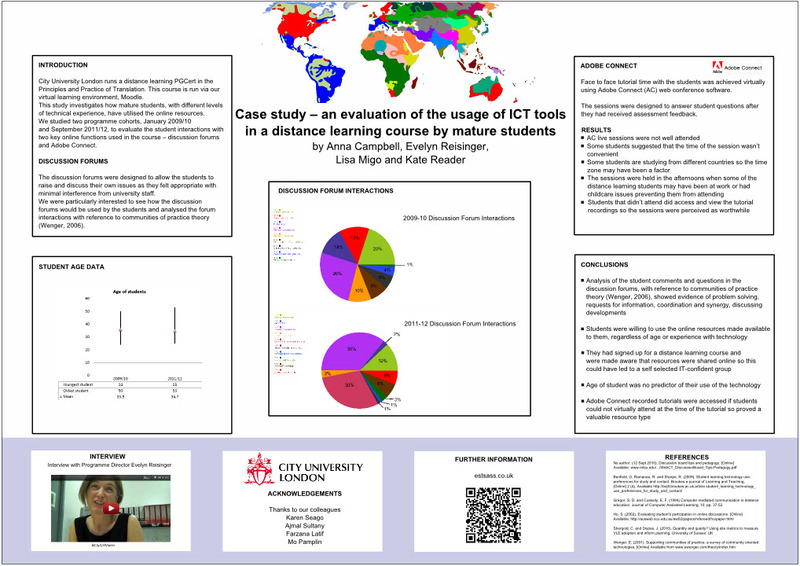 Our poster is a case study of a distance learning course, the PGCert in the Principles and Practices of Translation. 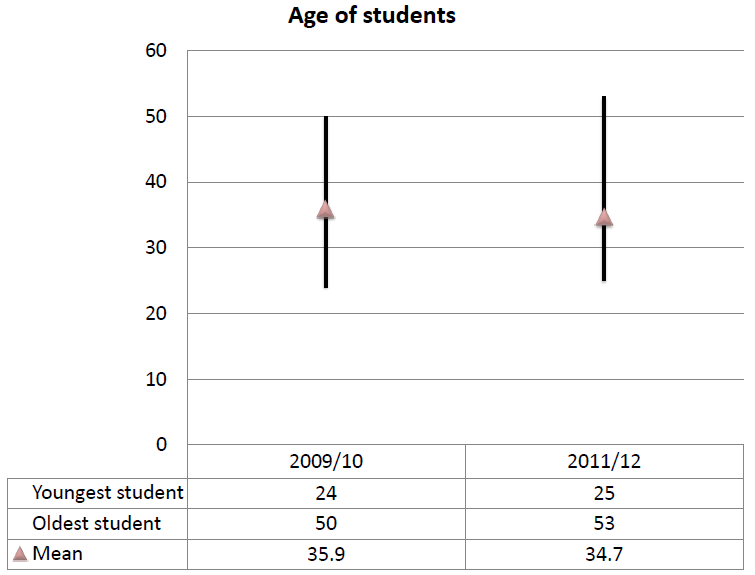 The vast majority of courses at City University are blended learning courses (using a mix of face to face and online resources) so we were interested to see how the students on a distance learning course utilsed the tools made available to them in Moodle. The poster outlines how mature students from two cohorts on this course, with different levels of technical experience, have utilised the online resources, focussing on the use of discussion forums and Adobe Connect. Evelyn Reisinger, Course Director, set up a news forum and discussion forums in Moodle. These were designed to encourage the students to raise and discuss their own issues as they felt appropriate with minimal interference from university staff. I was interested in whether the students utilised these discussion forums to create a community of practice (or communities of practice as there are a number of language combinations available within the programme). This draws from the work of Etienne Wenger (2006). 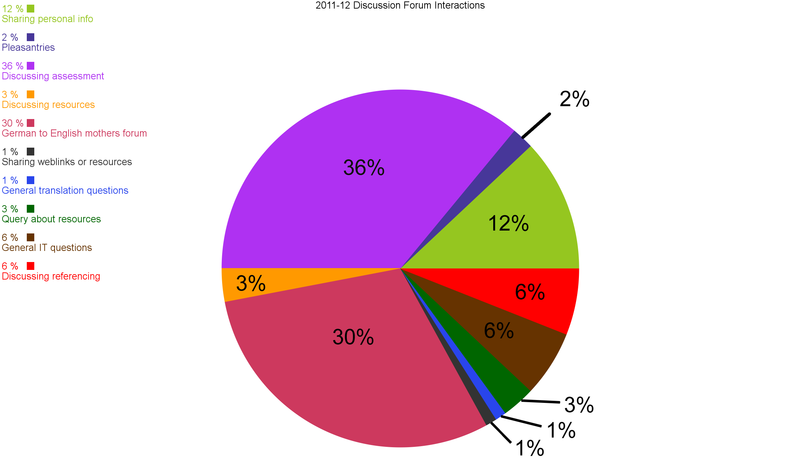 I completed a content analysis of the discussion forum postings for each year group. I did this by reading through each post and categorising it in terms of its content. The contributions on the discussion forums specifically relate to some of the criteria for communities of practice as outlined by Wenger (2006). 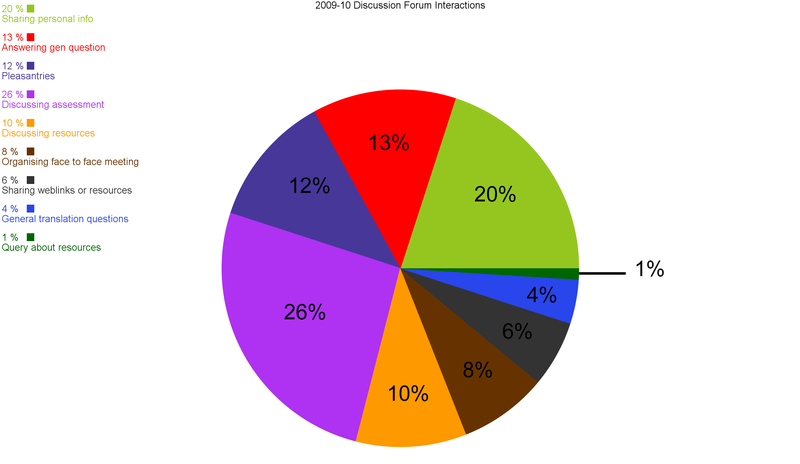 These include problem solving, requests for information, coordination and synergy and discussing developments (see the percentage interaction for each cohort below). The academic staff were keen to have some face to face tutorial time with the students. This was done using Adobe Connect (AC) web conference software already in use at the university. The sessions were specifically designed to answer student questions just after they had received assessment feedback. The students sent in their questions before the session and the course lecturers answered them in text form on Moodle and through AC.